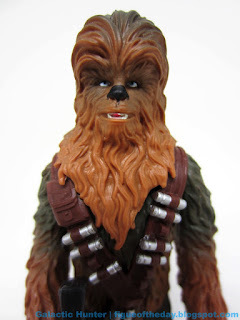 Commentary: I was pretty pleased with The Last Jedi's take on the character, but since he has the most significant change in appearance, well, ever, it makes since Solo: A Star Wars Story gets its own Chewbacca. He looked sort of like his original trilogy appearances in Revenge of the Sith, so the decision to change up his hair a bit and give him a new bandolier - and a new weapon - is interesting. I assume he needs replacements because his are lost or stolen. 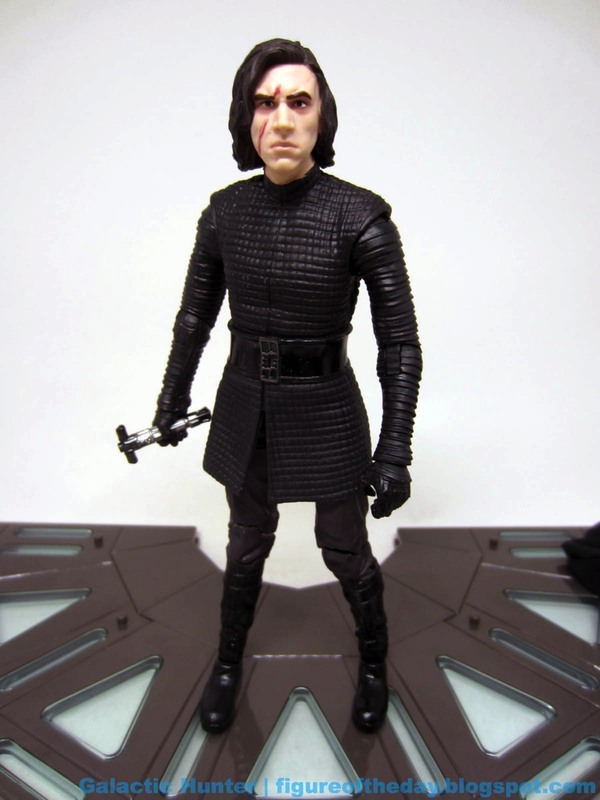 He's almost the same as his The Last Jedi release, with similarly posed arms and legs. The fur is tweaked a bit, and the torso and head are new - but they're clearly made form the same basic sculpt. This is more than a little disappointing, because side-by-side they look strikingly similar. 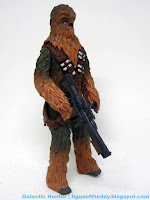 The new prequel Chewie looks taller thanks to the new head, which is easily one of the best Chewbacca heads at this size. It's expressive, with a painted mouth interior and blue eyes. And a black nose too. Articulation is also slightly improved, as his neck can actually turn well for a change. A lot of Chewbacca figures have a neck joint, but it's obstructed because if his beard and hair - this one has a real range of motion thanks to some clearance around the bandolier. I have a feeling that some of this era of figures could be a real treasure later just because there's so little of it and nobody seems to care. 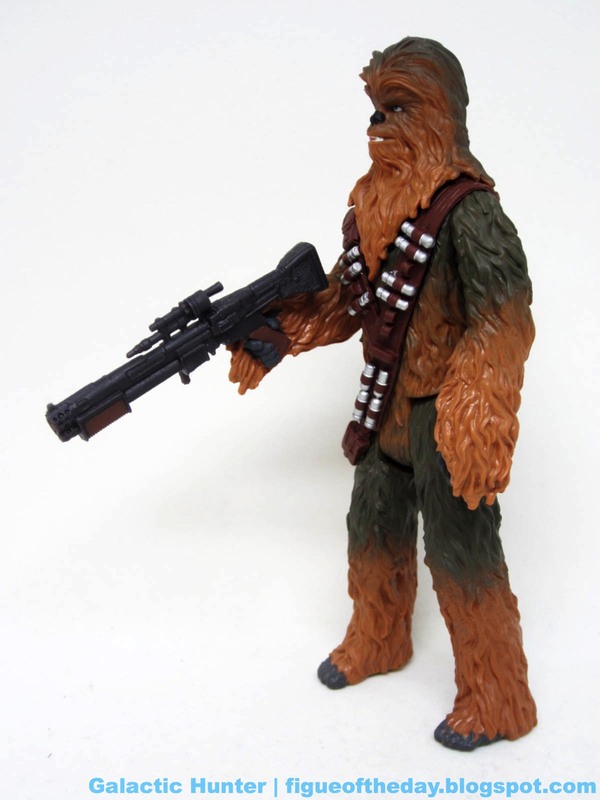 It's a good figure, but I doubt kids are going to get a nostalgia pang later just because Chewie barely fits in the new Millennium Falcon. There are a few places to fit figures, and you really have to get him in there just-so. He's really big, and awesome, but figure-vehicle compatibility would just barely skirt by - he meets the requirements, but it takes a bit of contortion. 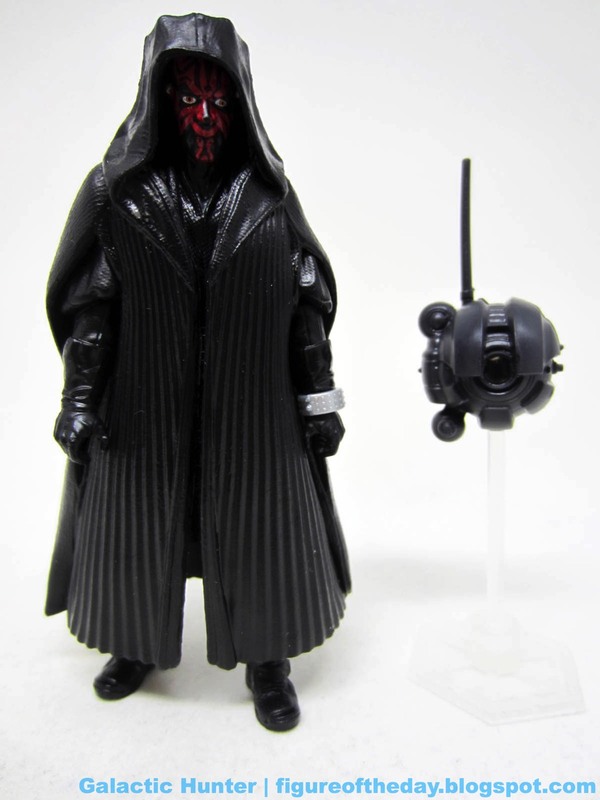 This is more of a knock against the vehicle than the figure - I like the figure a lot, and the different Y-shaped bandolier and new gun is more of what I would have expected we would get in Revenge of the Sith. I appreciate the changes, because really, give me something different. This is different. Get it if you find it - even if it lacks Porgness. Commentary: Nearly every decade, Hasbro (or Kenner) gives us a Wampa. We got one in 1980, and 1997, and then another in 2004, and now another new one in 2018 - and it might be the best yet. I love the simple cord arm-smack of the original, and the bloody arm stumps we've gotten since are neat - but I never really loved the bloody mouths. 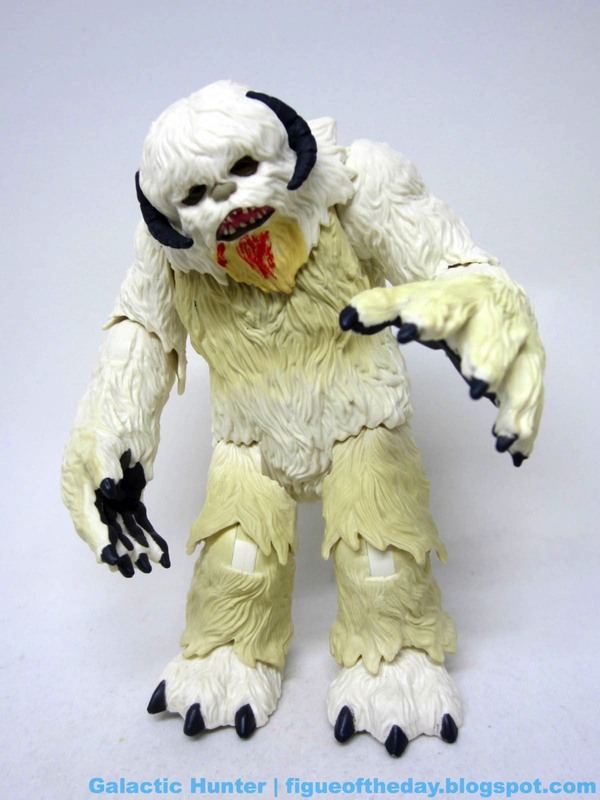 This new one looks perfectly nice, and as far as I can tell it's a new sculpt with the most limb articulation on a 3 3/4-inch scale Wampa yet. So it's a keeper. 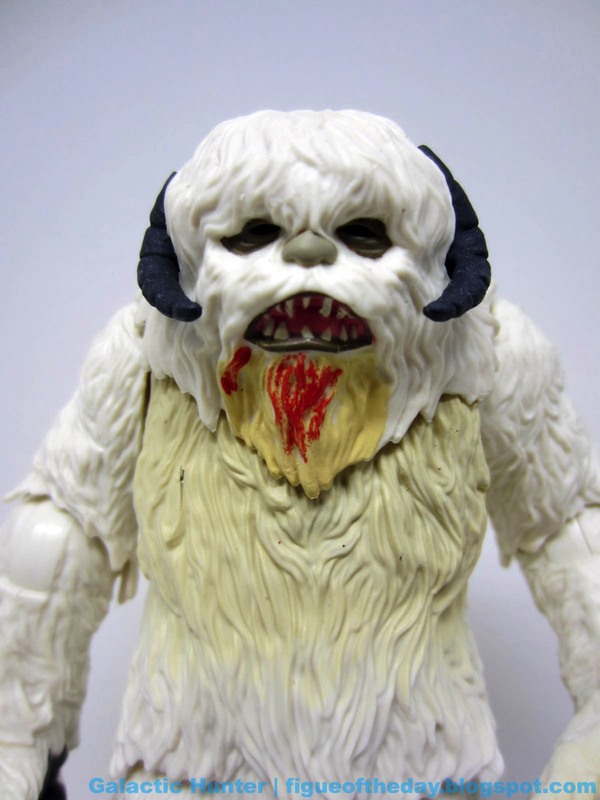 Every time we get a new Wampa I'm a little disappointed no cave came with it - the last one had some ice chunks, this one doesn't. It's just a big guy with Luke, but it's a good big guy. 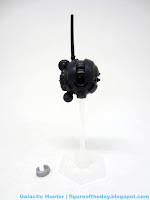 The lfet shoulder, both elbows, knees, and ankles have ball joints with swivels at the neck, hips, and right shoulder. This is about as good as these get, and the right shoulder can be sliced off with a bloody stump left behind. The designers did a great job sculpting it and painting his horns, claws, slips teeth, toe beans, palms, and nose with a light dusting of yellow to imply shading and/or urine. (Obviously, I'm kidding about that.) The deco is about as good as we usually get, mostly because there's not a lot of room for improvement - at this point, the most dramatic change Hasbro could make would be to do a Wampa without facial blood. 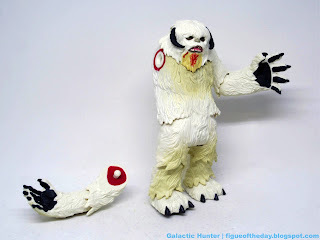 The main draws of this toy will be just having a toy of the Wampa - the last new mold was a while ago - and the sound chip. 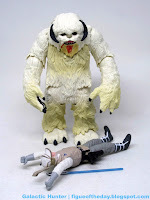 Since the new Force Link 2.0 band comes needing a Day 0 firmware update, I can't test it - but I can say that the elbow and knee joints make for a surprisingly new experience with a Wampa toy. He can finally hunch over a bit to look like he might eat some Tauntaun, and I love that functionality is finally here. After all, most of what we saw it do was smack Luke in the face and, in 1997, hunch over lunch. You no doubt have a few Wampa toys by now, but this may be one of the best. I love the 2004 ice set-up, but as figures go this one has a better sculpt with more articulation and great deco. I like the new face better too. 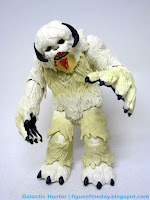 Shaggy, cute, mean, and just so gosh darn nifty, this is the best Wampa figure for the 3 3/4-inch collector. If you ask me. And you did, by reading this - it's just unfortunate that it's one per case with an assortment cramming yet another Rathtarr on store shelves. Packaging Notes: This is a comical waste of space - the box is mostly empty. The Wampa is tucked behind a window showing Luke, so about 70% of the packaging is empty, wasted space - this happens a lot. Sometimes it's because an item is thin and log, but in this case it's just a huge waste of space. A great toy, but the unboxing experience can be an important first impression - and this one has a great toy in a lousy, empty waste of a box. Hasbro did a pretty good job here, my only real desire was for a figure that could sit and they came close. We got a guy with lumpy underthings under a gold robe and wacky curled toe shoes, possibly furthering the Hef analogy. 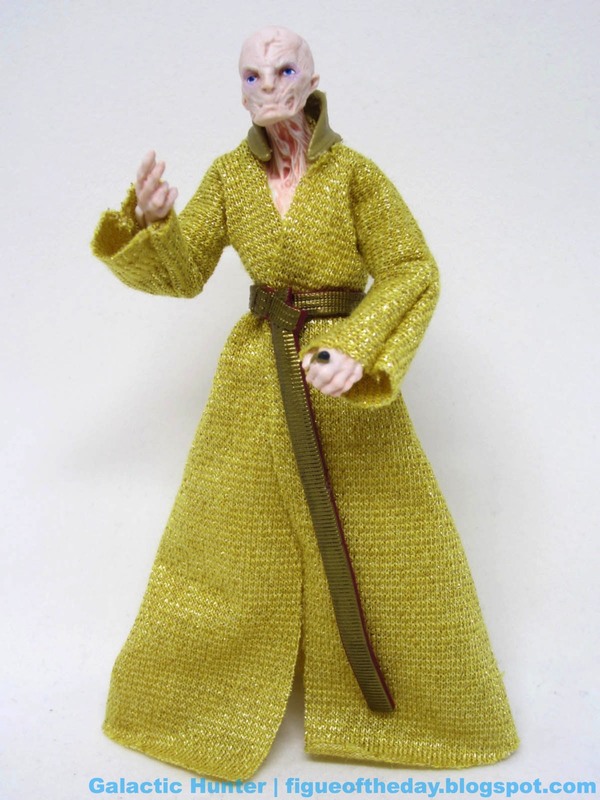 It's one of Hasbro's best executions of soft goods on any size, with snug sleeves and a decent, flowing gold robe. The plastic belt - weirdly molded in red and painted gold, why? - dangles between his legs getting in the way of sitting on a throne a bit. You can still move it a bit so he can sit, and with the great bend-and-swivel hands plus swivel elbows you're going to be able to get a figure that sits and emotes nicely. He's a little light in facial detail, a pity given the price and lack of accessories. 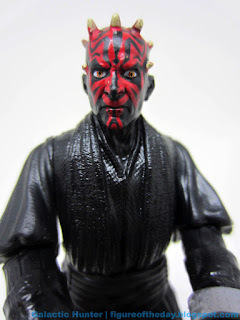 I like the sculpting, but a little paint in the eyes or the scar would have gone a long way. He's creepy and loosely recalls some of Karloff's monster make-up like a missing chunk of his face, making for a very good, very tall, and very creepy humanoid. He stands roughly eye to eye with Chewbacca, for crying out loud - he's huge. Given the simplicity of the design, the sculptors and seamsters did a great job here. Everything is where it should be and the colors are about right. 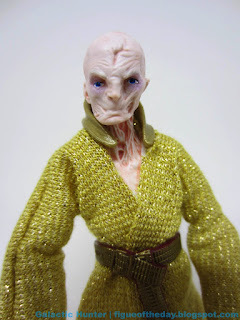 I just wish the head had some more deco - and maybe the collar on the robe could be a material that blends with the cloth more closely. It's not a huge deal, but it's visibly different. 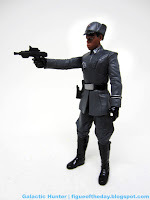 Overall it's great, and is the only new figure in the first batch of six The Vintage Collection figures. All of the rest have been sold at Walmart as The Black Series figures, for as little as $4. This one hasn't - get this one. If you haven't got the others, go get them too. 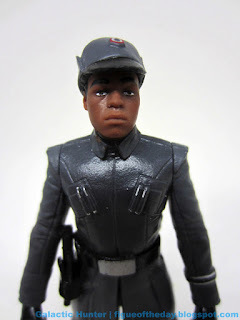 Commentary: While not one of the most popular characters as toys go, tastemakers know Finn (First Order Disguise) is a dang fine figure in a pretty great set. 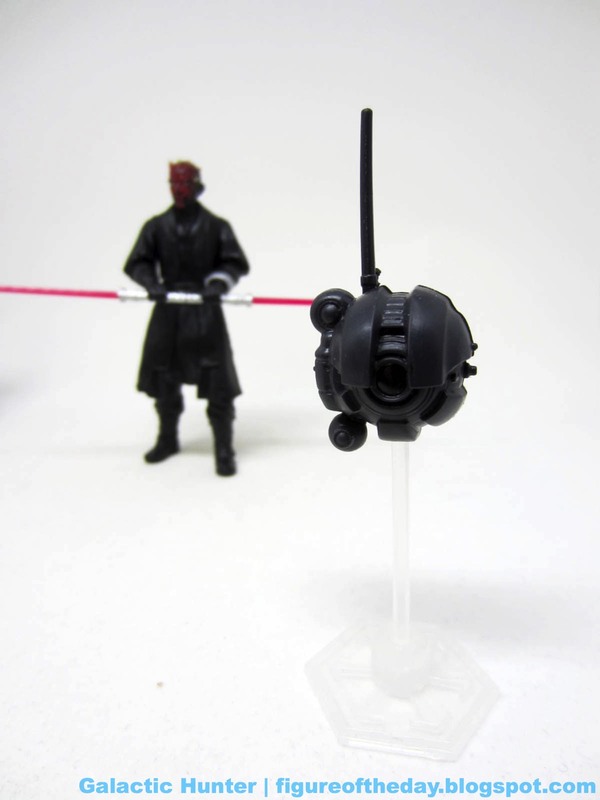 For a figure with five joints, Hasbro made sure it had a great range of motion along with good paint and accessories. In short, it's better than I would have expected. 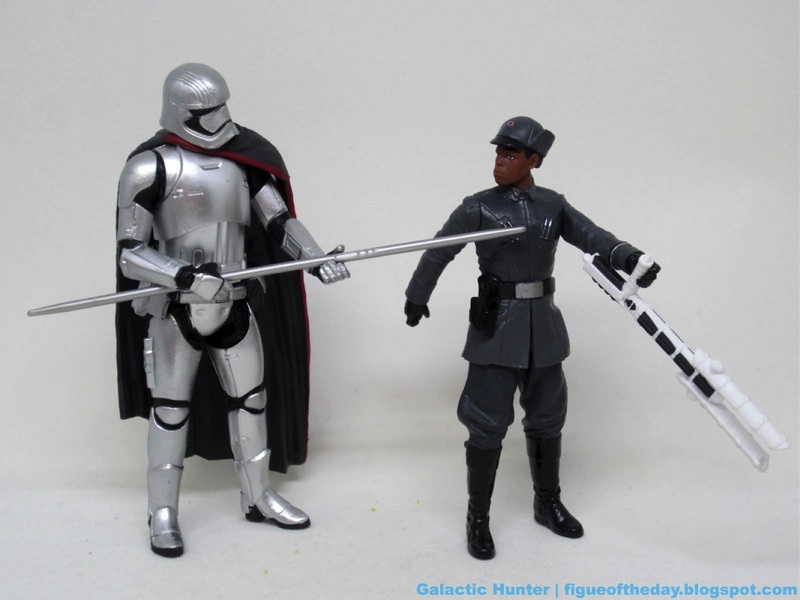 This Finn is way more interesting than the single carded Finn [FOTD #2,442] last year - with the same weapon and jacket, to many fans he basically was the same figure from 2015. (He wasn't, but perception is everything.) This outfit is new, distinctive, and has a cool weapon - this is the one I wanted. Too bad it wasn't a launch toy! The arms and legs are stiff and rotate rather freely, with the soft "skirt" bits easily giving way to the legs swinging forward. It's great! This is how figures should be. The sculpting seems to be from the same digital source as other figures in this costume, like the 6-inch one. 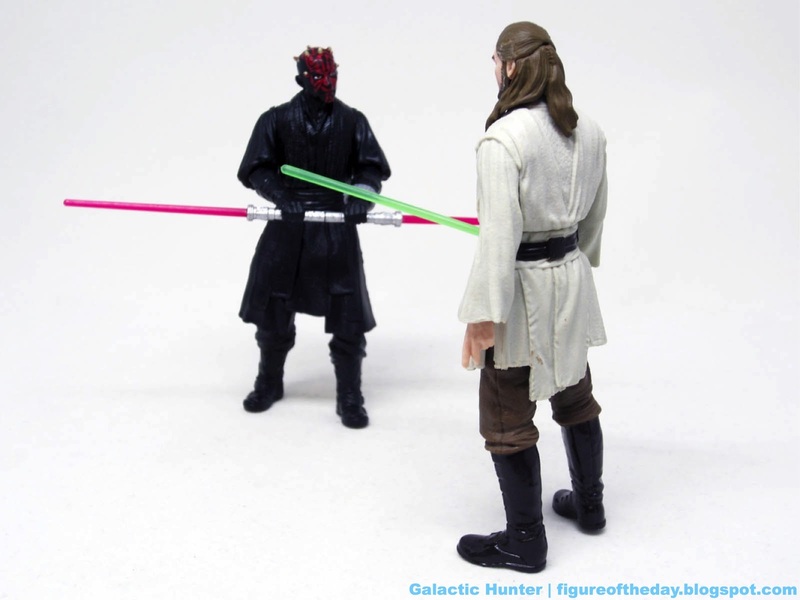 There are differences for articulation, but they're staggeringly similar. He has no problems standing, and while I kind of wish we had better arm articulation for dueling purposes it's decent. He can still wave around his weapon, but his hat isn't removable so you can't exactly replicate the climactic anti-climax of the duel. The cap is great, though - there's a tiny First Order symbol and a lot of tiny, difficult-to-see detail in the emblem. They did a nice job here. The facial details are crisp, and while it's easy to knock at this size it's also tough to paint good eyebrows on something smaller than a peanut. I'm pretty impressed. I'm also biased, but I like it, it's different, and that's about all I can ask for. Get one if you can! Force Link Notes: "I'm with the Resistance." "I can disable the shields, but I have to be there." 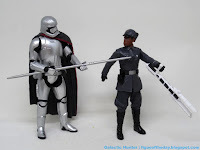 "You don't know the First Order like I do." "You want me to blast that bucket off your head?" Baton sounds. I believe most of it is from The Force Awakens. Commentary: After more than a small delay, this Kylo Ren 6-inch action figure finally started to hit Walmart. There's no indicator as to whose exclusive it is - perhaps they weren't sure during production - but there have been exceedingly few exclusives in recent years that were ultimately hard to find in the long run. 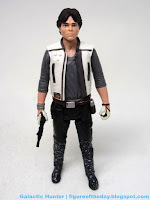 This one is like the other "premium" Luke and Rey, in that the faces have more paint, they all have big display bases, and there are cloth and metal parts now. It's better - mostly. 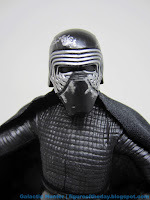 If you got the main line's Kylo Ren [FOTD #2,454] you've already got the same body and the premium price may not be sufficient for you to double-dip. But if you don't have either? Try to get this deluxe one. The base figure has a brighter silver belt buckle and slightly deeper, richer blacks on the body. He still has the same great elbows, wrists, ankles, and other joints that make him very flexible and great for posing in numerous poses. The main changes on the core figure are the head - it has a sort of transitional paint job that's not quite as good as the printed 2018 figures, but it has more going on than the 2017 figures. The scar looks fresher and redder, especially against his slightly darker hair and fairer skin. The eyes have a little more shading around them, and while I believe it to be the same sculpt it seems like a sharper output. 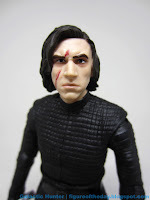 It might also just be an illusion from the lighter plastic, but he looks a little lumpier and more realistic. You can see more ridges and bones - on every level, it's a harsher production piece and all the better for it. The metal bonus parts were selling points for me. The die-cast metal helmet looks great and feels wonderful. It has silver highlights on the front and scuffing on top that looks decent. 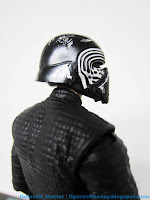 It's clearly fake scuffing, but it's nice enough and the painted helmet looks better than the molded-in-black helmets. The interior is molded plastic, and it's a tight fit over the neck peg. What's more, the lightsaber hilt is more silvery and also metal - it plugs in his belt much more easily than the plastic one last year. 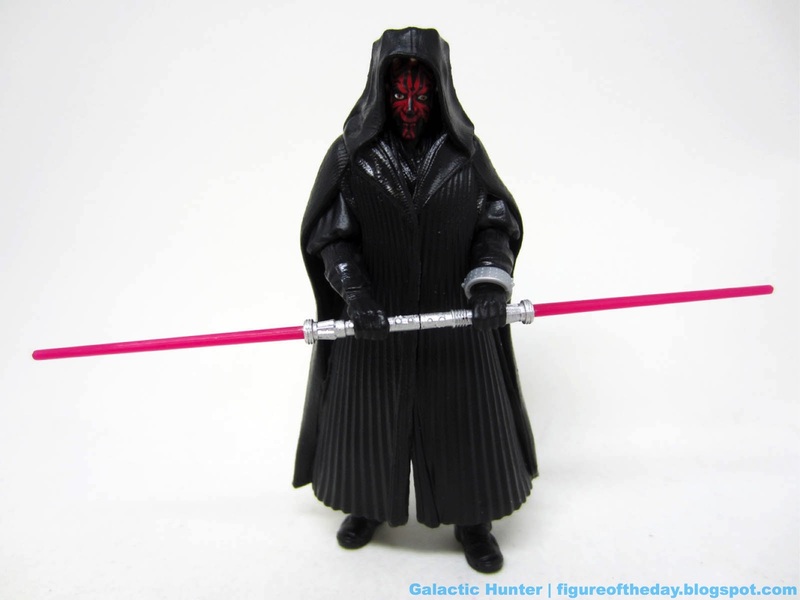 The basic lightsaber is the same basic one as the regular figure, but with more light silver on it. It looks better. The only accessory here I don't prefer is the cape, since the cloth over-the-shoulder and no-clasp cloth accessory looks a little cheap and doesn't drape as well as the plastic one. 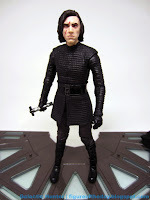 It needs more to grip his neck or shoulders, so the end result isn't as good as what we had before - you may want to mix-and-match parts to make the deluxe Kylos Ren of your dreams. Commentary: When I first saw the Centerpiece concept (and price point) I rolled my eyes and said "well, this isn't going anywhere good. Some concepts haven't made it out, but the very best one that I was really excited to see can now be yours with Kylo Ren. Doing new form factors raises questions like "Why?" Hasbro has sold collectors no fewer than 6 total The Black Series 6-inch Kylo Ren figures since 2015, and there's lot a lot genuinely new to offer on most - this one took advantage of the form and gave us a movie moment we haven't really seen well-represented. 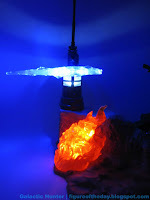 This time the figure has no articulation, and you have to plug in the flowing robes to make it work. 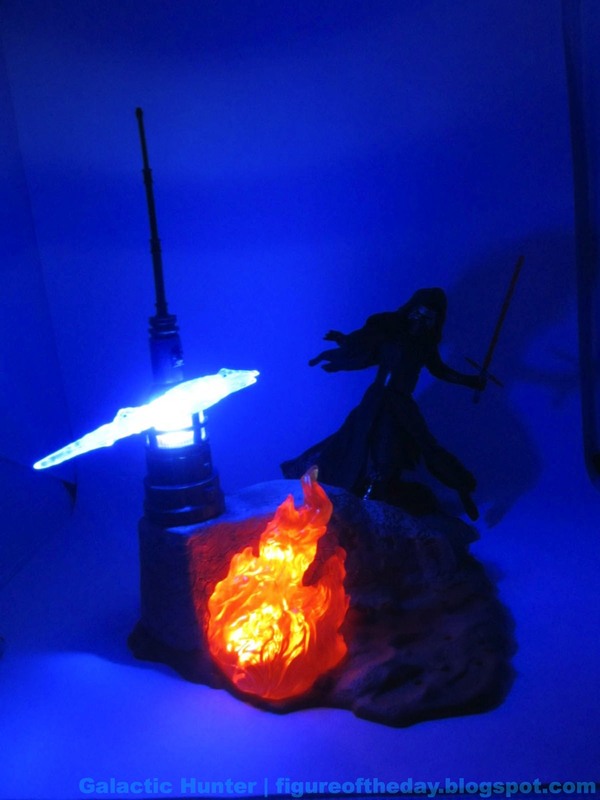 Once assembled you get some rock and ruins, plus the super-cool blaster bolt Poe Dameron shot at Kylo Ren in the opening scene of The Force Awakens. Representing the Force is a tough thing to do in toys, but this does a bang-up job showcasing one of the most memorable moments of the new movie generation so far with a bright glowing blue bolt and some red flames... plus a lamp. This is a toy that really feels like it makes use of the electronics and budget well, as opposed to Luke's weird attack run on Hoth or the not-quite-Rogue One Darth Vader. The deco is great, and the lights are bright - push the button for 12 seconds of visuals, or hold it in for a few seconds and it stays on until you push it again. It takes 3 "AAA" batteries and that seems excessive, particularly given that USB or another greener way of doing things would have been nice. 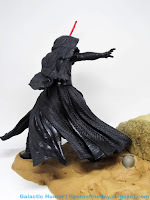 Kylo Ren lacks display options in the figure itself, but the base gives you the choice of putting one or both feet on to give him some distance from the bolt. If you're hard up for shelf space this is particularly handy. Space can be at a premium, especially now. Foot pegs under the base allow you to plug in Stormtroopers to fill out the scene, were you so inclined. I like having options. 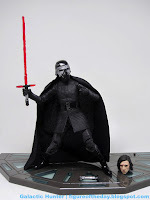 Hasbro's sculptors did an awesome job giving Kylo Ren life with an action-oriented pose showing a quick turn and mastery of the Dark Side to save his neck. 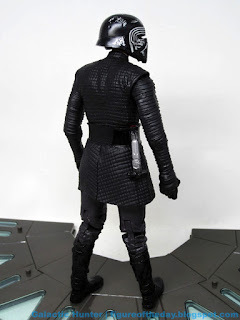 The robe textures are some of the best in this line, and moving away from cloth gives us one of the best Kylo Ren collectibles yet. He just can't move - what you see is what you get. It's amazing with amazing detail in the arms, legs, boots, helmet, hood, and everything else - but if you don't love the pose, this is pretty much it. 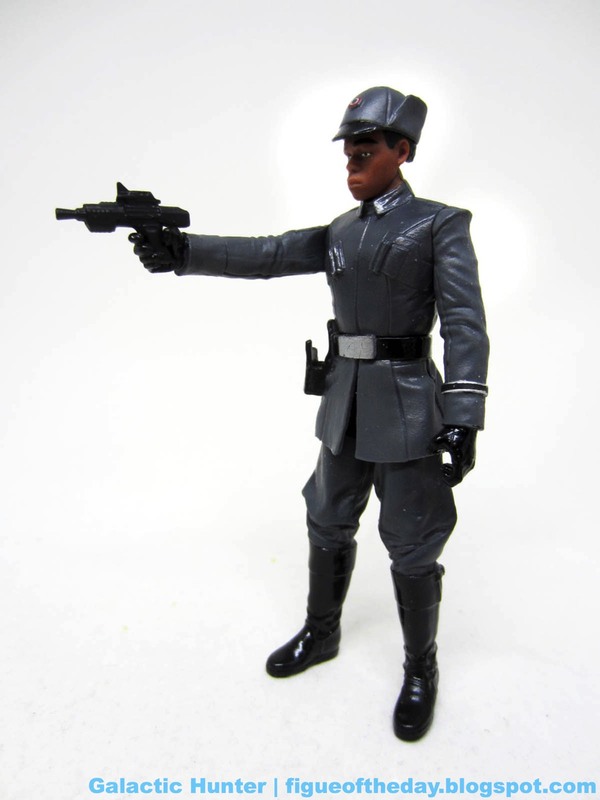 You could also swap out another The Black Series Kylo Ren if you want, but I like this one here just fine. While it's pretty stunning and on par with some of the statues we get - except plastic - so as a statue, it's cool and priced well. As an action figure, it's a lousy deal - a $20ish figure, minus articulation, with a $30 base with a couple of LEDs seems nutty. The final product does look excellent though - so I'd say Hasbro has justified taking your $50 here. They made something really good here - even though it's expensive. If you see it on clearance and don't buy it, I pity you. 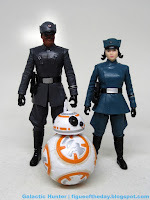 I'd even say buy it at full price and hopefully Hasbro continues the line with scene-specific takes on things you might want like Boba Fett, or something relating to Han Solo in the Carbon Freeze chamber, or (if you'd let me) a multi-figure set focusing on the Kylo Ren and Rey team-up from The Last Jedi against the Praetorian Guard. This format has potential for amazing things, if Hasbro keeps it going I bet it could turn around - much like the original 7-inch Unleashed line took a few waves to really kick off. Packaging Notes: A significant improvement from the 2017 models, this one has a fifth panel box with velcro tabs and a ton of photography showing it off. It just looks and feels better, like Hasbro took the idea and ran with it. What we got before was the beta - this is a final release with a stronger pose and movie tie-in as opposed to the off-camera statues we got before. This is the first Centerpiece toy - and one of very few similar items even when comparing it to the Unleashed 7-inch line - modeled after a specific movie moment. It's much stronger as a result. Commentary: There have been no shortage of Darth Maul action figures since 1999. We tend to get a new one every year or two, often with new features or functions thanks to his appearances on the cartoons. While we got a super-articulated figure loaded with joints and accessories in 2012, this one is probably better just in terms of how it looks. You can't do crazy fight poses, but it offers a surprisingly good amount of play with little filler. 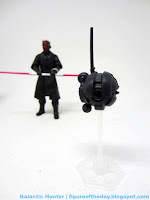 First thing is first - the Sith Probe Droid is awesome, and its stand is not. 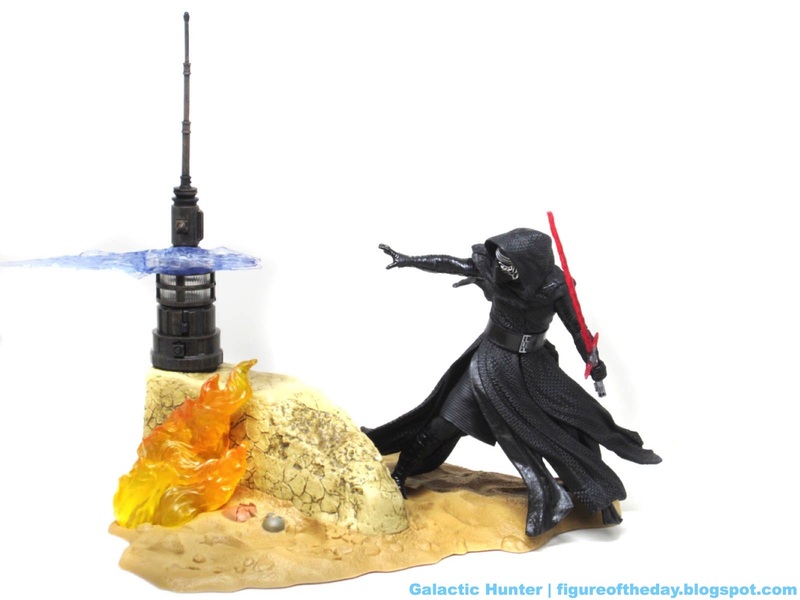 Hasbro and Lucasfilm can't keep their logos straight, as the base features a "Legends" logo from an ancient Sith Empire and not the Sith symbol used in the actual movies. This sort of thing happened a lot with Republic and Empire logos, and it's not unique to Star Wars - this Transformers sign got approved with minimal research. The stand won't make or break the figure, but it's always a little painful to see this kind of thing get approved when you've got scores of people at the company crowing about what big fans they all are at conventions. 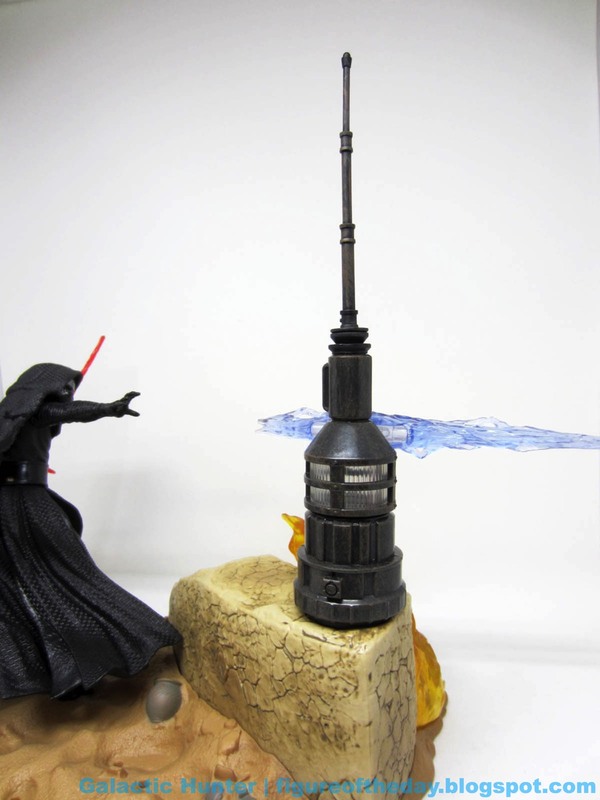 This sort of thing shouldn't happen - but it's functional, and the droid is cool. 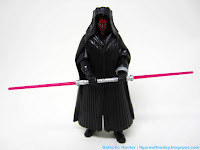 Darth Maul has 7 points of articulation and the most clever cloak I've seen on a Maul yet. It's a tight fit and splits down the middle, sliding over the arms and closing tightly enough to look like it's zipped up. Hasbro did a killer job here - the elbows on the figure can rotate so he can be posed while wearing the rubbery accessory, too. It fits his head perfectly, and doesn't hang strangely like the cloth ones often do. 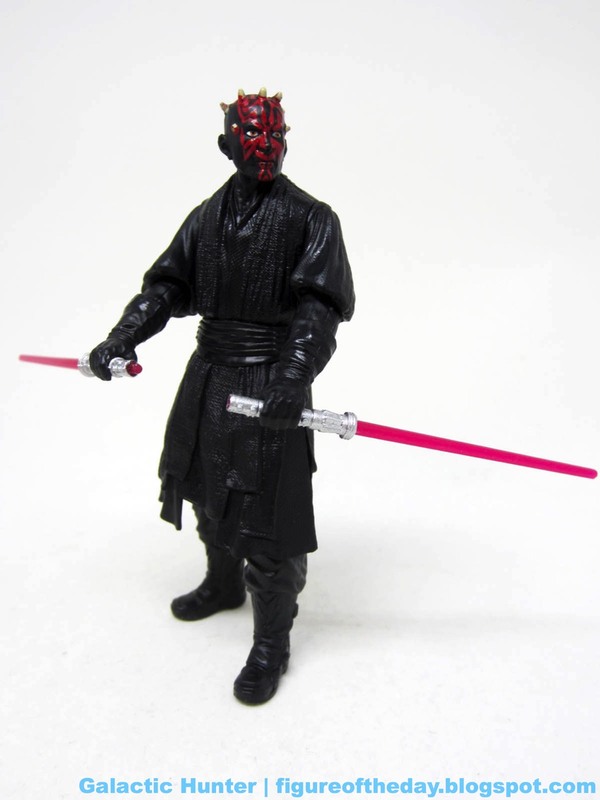 I love the snap-on droid controller bracelet, the lightsaber splits down the middle, and it's almost the best Darth Maul you could ever hope to get. Someone will prove me wrong some day, but for now this is one of the best tricked-out Mauls since the accessory pack in 1999 plussed up that first Jedi Duel version. The core figure itself has a great sculpt with a sharp design for the head. 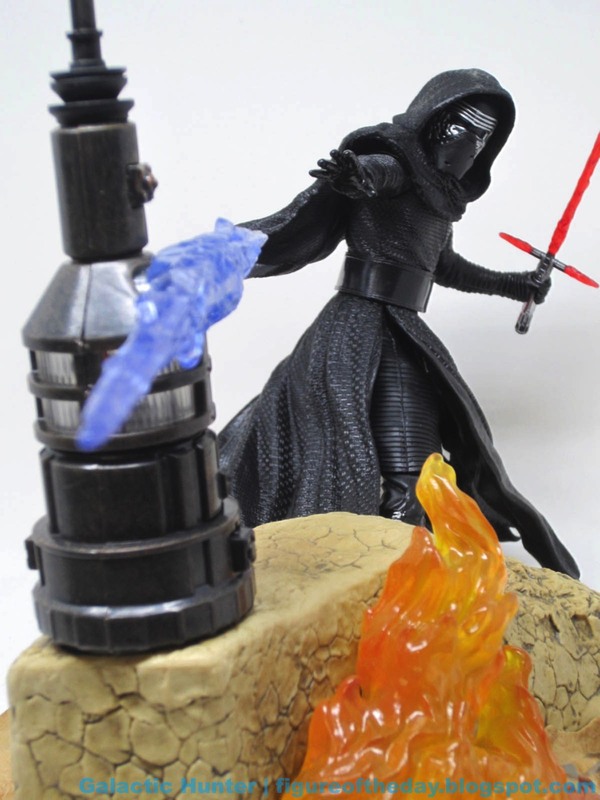 Everything seems to fit in place, and he can hold the lightsaber with both hands out in front of him - a rare feat. There's not a lot you can do to improve on the design, so subtle things like painting all the horns and adding texture to the robes goes a long way to making a ho-hum core character remake into something essential. Obviously you don't need another Darth Maul, but if you're getting this set for Qui-Gon this is a fantastic Maul to get. He can swing his legs forward, the arms move nicely, and everything looks good - short of the lack of a waist joint, this feels like the kind of improvement I would have expected from Hasbro at this point in the toy line's life. Except for the droid stand. I don't think any of us could have seen that coming. Force Link 2.0 Notes: After a firmware update, a soundalike says: "I challenge you - one warrior to another." "At last we will have our revenge." "I have been waiting for you." "Grrr." "I will make you share my pain." "You will not stand in my way. " The droid has no chip. I'm honestly quite disappointed that he and a bevy of others have sound-alikes, and not even quotes from the movie. After the firmware update, at least it generally works. Any app functionality does not seem to work with my iPad at this time - it crashes. Commentary: I was waffling between the new movie and old movies, but since I don't know anything about the new movie I decided to look on this surprisingly great Qui-Gon Jinn figure. Hasbro has largely abandoned Lucas' era of characters, but when they revisit them we always get gems. 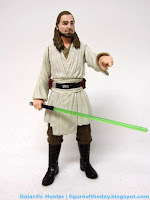 This Qui-Gon Jinn is right up there with Target's Emperor Palpatine last year - it's wonderful! A cloak would have been nice but this taller figure with a great face sculpt is some of their best work. The hair is carefully designed so it doesn't get in the way of the neck turning, and it doesn't look vaguely like a poodle's ears like the 1999 version. It's like a tiny, decent Liam Neeson sculpture. He's not super-articulated, but he looks better than the last super-articulated figure. He has the typical 5 joints plus rotating wrists, and this is a decent choice. His robes are more flexible, allowing him to easily sit. The hand can hold the lightsaber, while his left hand has that great Force gesture that the 6-inch figure had last year. While not identical, it's similar enough to the bigger figure to make it seem that they came from the same digital reference sculpt files. While lacking in the level of detail of the larger figures, the sculpt is still there and most of the elements are painted similarly. 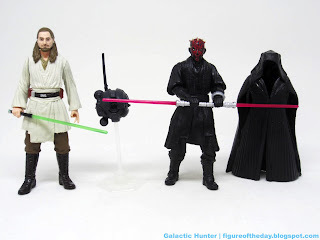 This looks about as good as I could hope for a Qui-Gon figure at this size and price point, plus or minus a few joints - and at this point I'd say articulation quantity is overrated. The fists don't easily pop out and the figure can actually sit, which makes it better than many. 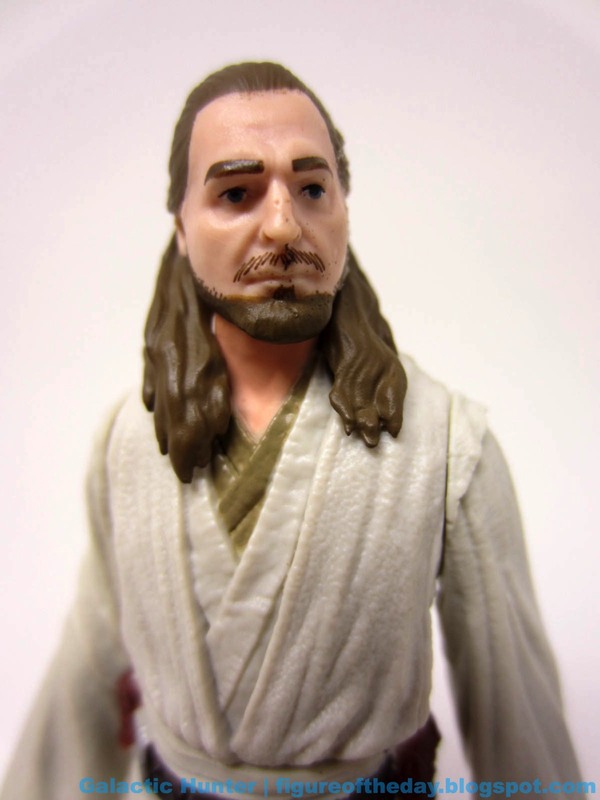 I doubt any long-time collector actively thought they needed another Qui-Gon figure, but this is a big improvement. It's excellent - and the Maul it comes with is no slouch, either. Do yourself a favor and get this set. 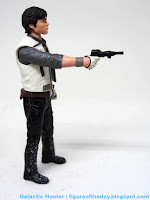 Commentary: So Han Solo (Corellia) is pretty neat. 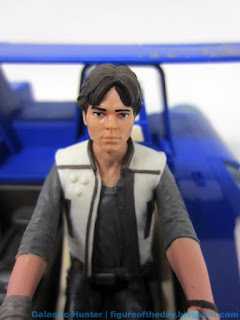 He looks like a cross between an old Kenner Han Solo head and the new actor, with an outfit that looks almost 1980s/1970s in design. The dark grey shirt looks like something I saw in a few old movies, with white gloves that look like something I've seen in a lot of old magazines about racing. The pants have sculpted (but not painted) stripes and there's no holster for his small blaster. All in all, it's a good pack-in figure but at $30 I would expect a little more deco. The splatter on the boots is interesting, but not exactly Hasbro's best work. The 5-jointed figure looks good, with a very young-looking face and a pretty nice vest. We haven't seen a lot of anything from this movie, so I can only assume it's accurate. The gloves are ornate, the vest has stripes and zippers, and even some of the stuff on his belt are painted. On his right hip are either Death Sticks or code cylinders, but they're unpainted - so I don't know. The figure has no holster for his small pistol, and there's no weapon storage in his big blue Landspeeder. I expect people will lose it. The speeder itself is pretty nifty - it's big, it's shaped like a book. There are all kinds of buttons, levers, and switches and I love that. The deco is nice, the size is good, but as a toy it's a mixed bag. Hasbro has been weak about including wheels - now I know there are no wheels in the movie, but this is a toy in the kid's line. Considering its crumplezone that sends the driver figure flying, wheels would be great as a play feature. While it earns points in authenticity, it looses some for fun. You'll love its weird look and cobbled-together feel, and the scraped paint and wacky spoiler are nothing to sneeze at. On clearance, this should be your first purchase. At full price, it's neat but uninspired. If you picked up Attack of the Clones Anakin or Zam speeders, it's like a bigger, better version of those. It has enough kid features to irritate collectors and enough collector features to irritate kids. 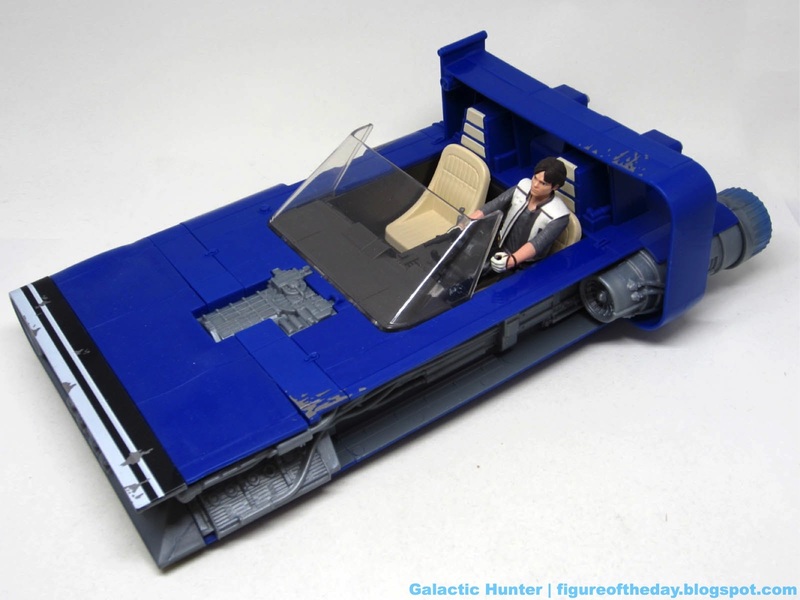 Han can sit in it just fine, and depending on how you pose him he flies out pretty nicely. I'm a huge sucker for vehicles an this sees to be one of Hasbro's better-scaled offerings. It's big, it's spacious, it has room for two figures. I would have loved a storage compartment for weapons and wheels, but all we got are an ejector seat and seating for two. As I write this I can't test its Force Link 2.0 features because the band locks you out of anything without a firmware update, and the app isn't up yet. This basically means the entire feature is "bricked" once your phone or smart device dies and stops being compatible with the app. This is just rotten - but the toy itself is still nice if you can get it for the right price. Packaging Notes: Because someone is deserving of less employment, this vehicle shipped in a case with a repack of the A-Wing from the last movie - in a red box. 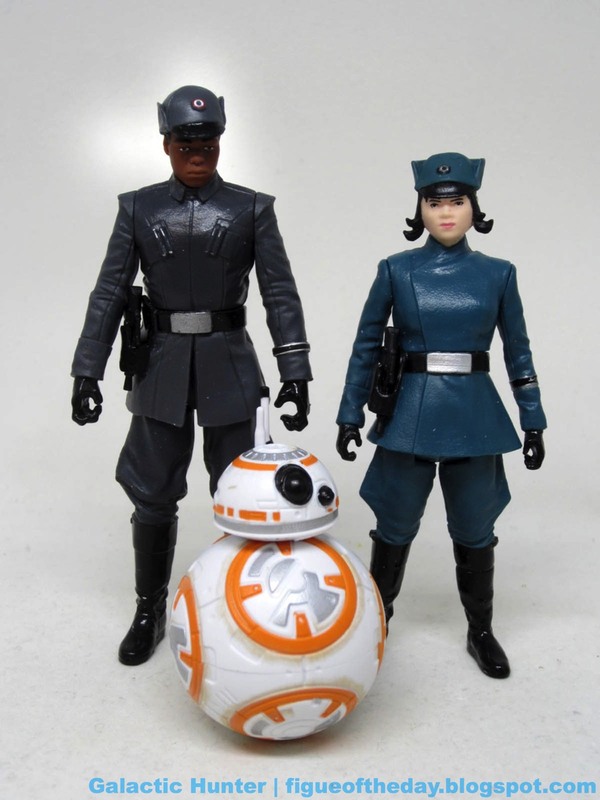 So it looks pretty much identical to the one on clearance before the movie line launched, meaning we're going to see a pile-up of the previous movie's toys because Hasbro made new product with new UPCs and SKUs again just like we saw with Rogue One. This is poor, poor planning.